When I can hit a few quest shops in one trip is always a good day for me. When I visited Gloryhole Doughnuts; half a block away was Yummy Stuff and I couldn’t have been happier to visit. 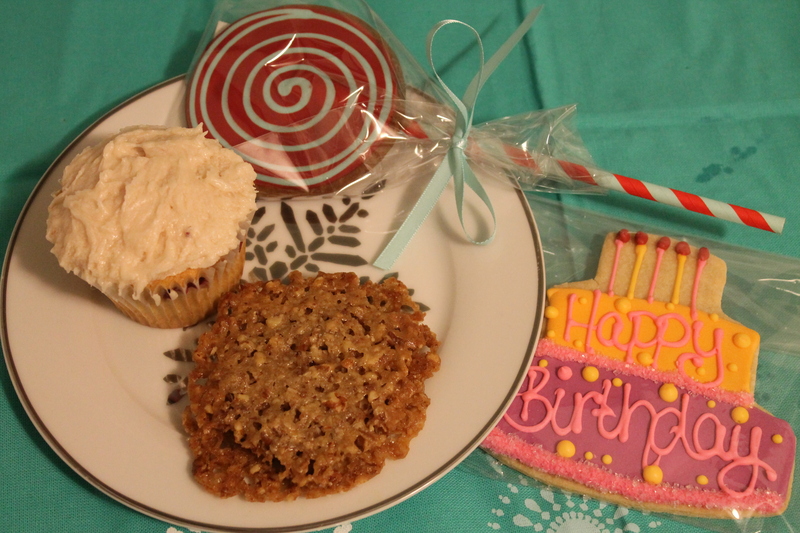 Since it was the week of my birthday I choose a few selections: Pecan Lace Cookies, Raspberry Cupcake with Raspberry Buttercream, Gingerbread Cookie and a Sugar Cookie that said “Happy Birthday” on it. The Pecan Lace Sandwhich Cookie was light and airy and didn’t taste like a dessert to me, even with the buttercream in the middle. The Gingerbread and Sugar cookies were quite tasty and my favourite items from the bakery. Mr. C. had the cupcake and he wasn’t really that impressed as the cupcake fell apart in his hands. It seems that the only thing keeping the cupcake together was the baking liner. As for the buttercream he felt the same way, it was just ok and nothing special. For these four items it came to about $20 with tax; which I found to be a tad pricy. I went here specifically for the cupcakes, but that in my opinion isn’t the best thing on their menu. I visited based on an article of the Best Cupcakes in Toronto, but somehow I think some other bakeries and shops have come up in the meantime to eclipse these cupcakes, including my own on a good day. Go for the cookies, lemon bars, and brownies and other treats I say.